For women who are considering breast augmentation, there are a variety of sizes, shapes, and types of breast implants to choose from. Our board-certified plastic surgeon, Dr. Mark Richards, offers a number of advanced breast implant options that can help you add volume to the breasts with beautiful, natural-looking results. During your initial breast augmentation consultation, Dr. Richards will talk with you about your ultimate goals, and help you determine the best options for your unique needs. One of the most important decisions you’ll make as part of your breast augmentation procedure involves your choice of breast implants. Fortunately, advances in plastic surgery and breast implant design have yielded a number of good options for an array of body types and aesthetic goals. Dr. Richards believes that adding volume to the breasts is just one aspect about breast augmentation – it’s also about improving proportions of the breasts and creating results that enhance and complement your silhouette. Breast implants come in round and teardrop shapes, as well as a wide range of widths and heights is a teardrop implant is chosen. They are also available in a number of different profile ranges – low, moderate, and high projections – to accommodate your goals regarding breast projection. At your initial consultation, Dr. Richards will show you many different examples of breast implant sizes and shapes, and you can even hold some of them to feel the differences. Silicone breast implants are made of a thick silicone liquid gel encased by a silicone outer shell. They are known for their ability to create a very natural appearance and feel, but look round in certain body positions. 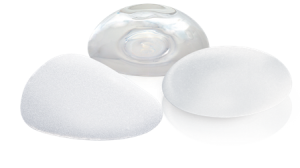 Silicone implants are approved by the U.S. Food and Drug Administration for breast augmentation procedures in patients over the age of 22. They are approved for use in breast reconstruction procedures for patients of any age. Also called cohesive gel implants, gummy bear implants are one of the most exciting recent innovations in breast augmentation. Designed to provide the most natural looking and feeling results possible while also potentially enhancing the safety of breast enlargement surgery, gummy bear implants are distinctive due to the thickness of the silicone gel inside the shell, so that it is more like a warm “gummy bear” (even if cut in half). 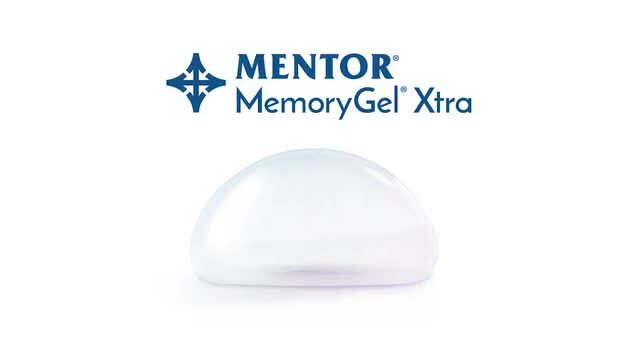 This cohesive gel retains its shape better than traditional implants, helping to reduce the risk of rippling or the appearance of circular roundness. Studies have also shown that gummy bear implants have a lower risk of capsular contracture (scar tissue formation leading to hardness) and implant leakage, even when placed above the muscle to avoid the deformation with muscle movements that occurs after sub-muscular implant placement when the chest muscles contract. As with other implant types, gummy bear implants are FDA-approved and come in a variety of heights, widths, and projections outward. The most common type of implant used in breast augmentation, saline breast implants are composed of a saline (salt-water) solution encased by an outer shell made of silicone. These implants have been in use for decades, and have proven to be very effective for adding volume to the breasts with beautiful results. Saline breast implants are approved by the U.S. FDA for patients over the age of 18. Dr. Richards will help you narrow down your choices of implant type, shape, and size during your consultation. He will also answer any questions you may have, and talk more with you about what you can expect from the entire breast augmentation treatment process. Dr Richards has a great reputation and is extremely knowledgeable. He is also one of the nicest doctors I have ever been referred to. I came to him for advice after developing a bacterial infection from breast implant surgery that had been performed by another doctor. His consultation was extremely helpful and he really cared about my well being. I followed through with his recommendations, and because of his urgency I ended up back in surgery the same day to remove the implants. I truly believe he saved me from a situation that could have been life threatening. I have heard and read wonderful things about Dr Richards and am upset with myself that I hadn’t gone to him initially when I was considering breast augmentation surgery. Anyway, thank goodness I am in touch with him now and look forward to scheduling a follow up surgery to get breast implants inserted properly. Breast implants are used in a variety of breast procedures and not just for augmentation. For instance, implants can be used in breast lift surgery as well as breast revision surgery. If you’re considering either of these procedures, Dr. Richards can help you determine which type of implant offers you the optimal outcome based on your expressed goals and anatomic needs. A breast lift is designed to restore the breasts to a higher, more youthful position and create a rejuvenated appearance in this area. In some cases, this procedure may reduce the size of the breasts, depending on the degree of ptosis (droop) and how much skin and underlying fatty tissue is removed. If you would like to maintain or further increase your current cup size, or if you would like to enhance the shape of your breasts, implants may be one way to achieve this goal. We understand a natural-looking result is often key for many women, and Dr. Richards strives to obtain an outcome that looks and feels as close to real as possible. There are several reasons why a patient would choose to have breast revision surgery. She may wish to exchange saline implants for silicone, she may wish to increase or decrease the size of her implants, or she may wish to remove them entirely. Some women experience a rare condition called capsular contracture, where the scar tissue surrounding the implants becomes hard and even painful. Another unusual occurrence is implant rupture. For each of these situations, Dr. Richards can develop a customized treatment plan tailored to suit the unique needs and goals of the individual, including selecting new implants that offer the best avenue for success. Your comfort and care are our highest priorities, and we are happy to review all your options during your initial consultation and help you become well-informed about what cosmetic outcomes are possible. If you would like to learn more about your breast implant options, or if you would like to schedule a consultation with Dr. Richards to talk about your breast enhancement goals, please contact Ageless Impressions Plastic Surgery Institute today.